The Text of the Gospels: First-century Mark: More Information! might be like) be published soon? 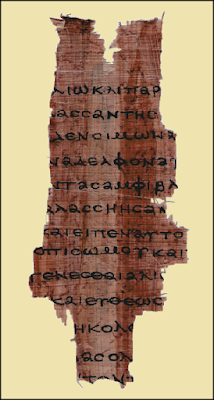 Remember the announcement in 2012 about the existence of a first-century manuscript-fragment from the Gospel of Mark? Here we are five years later, and after various rumors have come and gone, it has still not been published. This has led some folks to suspect that the announcement might have been premature, or that the dating must be wildly inaccurate, or even that it was all some sort of groundless claim. However, footage of a discussion between Scott Carroll and Josh McDowell from 2015, provided by Hezekiah Domowski, was found by Elijah Hixson, and was recently described by Peter Gurry at the Evangelical Textual Criticism blog. We already had the means to deduce – if one is willing to take the reports about the fragment at face value – that that the papyrus fragment is very early (possibly from the first century), and that it probably contains text from Mark chapter 1, and that Dirk Obbink was probably involved in analyzing its contents, and that Scott Carroll had seen the fragment. Now some of the “probably” factor seems to be diminished. We also learn in this video that the Green Collection does not have the manuscript, or, at least, that Scott Carroll was confident that someone else owned it in 2015. McDowell: He’s limited on what he can share, because it’s being published right now and all, and the owner of it might want to remain anonymous, et cetera. So he’s limited on what he can share with us. Carroll: Correct. These things are tricky. I first worked with the papyrus in 2012; so, it was discovered earlier than that. It wasn’t discovered by me. Although the group that’s working on its publication did some [??] – it’s very tempting, when you get the press, and Fox News, and other press agencies are after [it? ]; you want to get information on it, and some stuff was leaked, and they contacted me, I think, about a year ago, wanting some definitive information on how it was extracted from a mummy-covering. And I was not involved in that process. When I saw it, I can tell you, it was relaxed, which means it was flat. If it had been extracted – if it was extracted from a context like that, there’s no evidence of it, to me. It looks like it was just a text that was found. Now, a lot of the texts that come to light in this kind of context, like, if I went back to the picture, and we looked at the pile, you can see that a lot of this stuff has white on it; and that’s, like, the residue of the plaster. So these things came from mummy-coverings. Carroll: No, no. So, they probably were in a burial-setting, or something like that, and over time, it just separated, one from another, but we can look and it was originally part of it. Now, this Mark may have been in that kind of context; I’m not sure. I saw it in, at Oxford University, at Christ Church College, and it was in the possession of an outstanding and well-known, eminent classicist. I saw it again in 2013. There were some delays with its purchasing. And I was working at that time with the Green Family Collection, which I had the privilege of organizing and putting together for the Hobby Lobby family, and hoped that they would, at that time, acquire it. And they delayed, and didn’t. We were preparing an exhibit for the Vatican Library, and I wanted this to be the showpiece in that exhibit. McDowell: What does that mean? ‘The process of being prepared’? What does that mean? Carroll: It’s a lengthy process. Actually, going through – especially with this, because it’s gonna get – it’s gonna go out there, and there are gonna be people immediate trying to tear it down, questioning its provenance, where it came from, what it dates to – especially the date. So they want an ironclad argument on the dating of this document, so that it won’t be – um, they have a responsibility to do that. This is going to be very critical, and raise – it’ll be a major flashpoint in the media when this happens. McDowell: Who’s the main person responsible in the publishing [process?]? McDowell: This is a lot more information than we heard last time. Carroll: Yeah, it is. Dirk Obbink is an outstanding scholar; he’s one of the world’s leading specialists on papyri. He directs the collection – for students who are in here, you may remember hearing the word ‘Oxyrhynchus’ Papyri – he is the director of the Oxyrhynchus papyri. I can’t speak to his own personal faith position; I don’t think he would define himself as an evangelical in any sense of the word, but he is not – he doesn’t have a derogatory attitude at all. He’s a supportive person. Carroll: No. And, you’ve got that document there, and that’s the setting – it’s kind of surreal. And Dirk, Dirk was wrestling with dating somewhere between 70 A.D. and 120, 110, 120. McDowell; Whoa. That’s [??] an old manuscript. And Mark! Carroll: Mark is one that the critics have always dated late, so this is, like, I can hear their arguments being formulated now. So this is what the later authors were quoting. McDowell: That is just an assumption in there. So don’t go out and say, “There’s a manuscript dated 70 A.D.” How long do we have to wait, probably, to know specifically? Carroll: “I would say, in this next year, all right. Any delays that are going to happen over the next couple of months are delays with the publisher to publish this. If the route is to go to a major journal, they’ll of course want it to happen quickly, but there’ll be some delays through the whole academic process and all. McDowell: So keep that in mind; that, don’t go out and say, well, Dr. Scott Carroll says it’s dated between 70 A.D. – we don’t really know yet. But those are probably the parameters for it. But it will be – now this is my opinion – the oldest ever discovered. Carroll: Yeah; I think this without question. With manuscripts, um, the Rylands John fragment, it’s always like, 115 through 140 or maybe even later than that; so it’s kind of pushed to around the middle of the second century. This is gonna be earlier than that; textbooks will change with this discovery. McDowell: So When this hits the media, you will hear about it. McDowell: It’ll be on every program. So, be careful about what you share from tonight. It’s good to be able to be updated and to hear [?? ]; I didn’t know that. [Changing the subject:] What is one of the most significant discoveries that have been made in the last four or five years? And there the video ends. Thank you James. I hope they soon go forward with publishing it so everyone can see what's going on. Interesting! Any idea what verses are there? If I recall correctly, an early report mentioned that the fragment contains text from Mark chapter 1. I'm puzzled by the comment that "Mark is one that the critics have always dated late." I grew up with what I understand was a consensus that Mark was the first of the gospels, and it was written sometime between shortly after the First Jewish War and maybe 85, so this fragment doesn't change that at all. Now I know that the Church Fathers gave Matthew priority, but they also put Matthew as well as Mark and Luke in the time of Paul, which is earlier than 70 AD. Unless by critics he's referring to the mythicest community, I admit to being puzzled. So, yes, Carroll's statement is puzzling. I just categorize this sort of statement as sensationalism. It doesn't worry me much. the idea is that if this is a COPY (unless it is THE original) and it dates to 70-110 then the date of the writing in its original would be about 50 or so... time to get around the Roman Empire enough for someone to make enough copies that at least ONE would survive. Again, unless this fragment is the FIRST which is HIGHLY doubtful since the original would have passed around enough times to become worthless as a text to study or read. If they were to put such a fragment on display in a monter in a museum, or publish high resolution images, the Internet crowd wouldn't hesitate to transcribe it and date it to any time within Mark's lifetime if at all possible, and the debate would be wonderful, after which super-experts could research it more carefully and be credible. My gut-feeling says we are waiting for the ink to dry. "the idea is that if this is a COPY (unless it is THE original) and it dates to 70-110 then the date of the writing in its original would be about 50 or so... "
If the date of the fragment can be determined with some degree of confidence, which I suspect the experts are concentrating on just now, then we would have one of the greatest New Testament finds for centuries which would put some arguments, doubts to rest. Can you imagine when comparing the text of this fragment to the text of a fragment or manuscript 1000 years older that the text of the new Mark fragment and it turns out to be exact word for word? This would definitely send a ton of literature written about the unreliability of New Testament texts to the flames, as Dan Wallace is famous in saying. Here's the update: the manuscript is not from the 1st century.